Reference atlases are of primary importance in neuroscience research. To effectively compare anatomic and cell specific data from different modalities and experimental protocols it is important to have all data in the same coordinate framework. The creation of such atlases is a long-standing problem originally achieved by drawing on 2D histology plates. Modern coordinate frameworks enable the use of common landmarks for the integration of reference maps at differing scales in one common framework. A common coordinate framework (CCF) for the mouse or human brain must uniquely and reproducibly define any location in the human body. The CCF is a projected coordinate system in space that is defined relative to one or more origins. The challenges to developing any CCF is how to define a robust set of origin points that are practical over different anatomical scales and across the natural variability of the organism. The Allen Mouse Common Coordinate Framework (CCF) (http://atlas.brain-map.org/) is the main anatomic data browser and coordinate environment for mouse data within the BICCN. An essential tool to understand the structure and function of the mouse brain at molecular, cellular, system and behavioral levels, it has been successfully used for large-scale data mapping, quantification, presentation, and analysis and has evolved through the creation of multiple versions. The first version (in 2005) of the CCF (col. 1) was created to support the product goals of the Allen Mouse Brain Atlas (http://mouse.brain-map.org/.) The framework was based upon the Allen Reference Atlas (ARA) specimen) in which a 3-D volume was reconstructed using 528 Nissl sections of a near complete brain, with assistance of the PICSL group at UPenn. Approximately 200 structures were extracted from the 2-D atlas drawings to create 3-D annotations. A second version (col. 2) was constructed in 2011 to support the objectives of the Allen Mouse Brain Connectivity Atlas where a double-sided and more deeply annotated framework was needed. During the development, flaws in the 3-D reconstructions were corrected and the volume was mirrored across the mid-line to create a symmetric space. Eight hundred and sixty structures were extracted and interpolated to create symmetric 3-D annotations. In 2012, with the launching of the Allen Institute cell type program, a next generation CCF was needed to support integration of data generated at the cellular level in cortex. Version 3 (v3) (col. 3) of the CCF is based on a 3-D 10μm isotropic, highly detailed population average of 1675 specimens using 2-photon imaging. Currently, CCF v3 consists of 207 newly drawn structures in 3-D: 123 subcortical structures, 41 fiber tracts (plus ventricular systems), and 43 cortical regions, including primary visual and higher visual areas. Still under active annotation, the final product of CCF will ultimately consist of more than 500 gray matter structures, cortical layers, ~80 fiber tracts, and ventricle structures in 3-D. 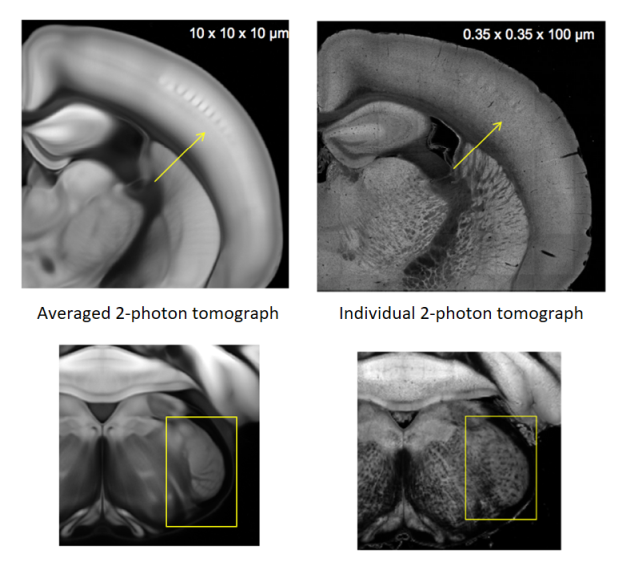 Distinct individual 2-photon serial tomographs are shown below. CCFv3 is now in use as the spatial framework to integrate and ultimately compare data collected across multiple large-scale projects and will be used in the BICCN. A) Cell centric data whose positioning within the common coordinate framework (CCF) must rely on coordinate based, visual, or ontological tagging. B) Image centric data for which an accurate registration to CCF using image processing tools is possible. 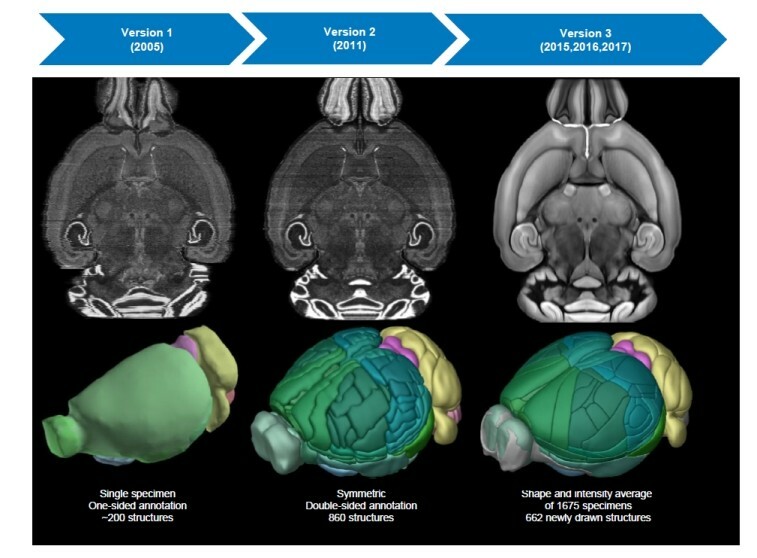 Given the challenge of determining anatomic context for any reference atlas even within the mouse, precise image registration cannot be accomplished in general unless a whole brain image series (or reasonable fraction of the brain) is present with sufficient distinctive anatomical landmarks. While the Allen Institute CCF is reasonably mature as a product and mapping environment, it will require some work to make this atlas framework extensible for more general community use. Cross linking this environment with new emerging standards will further expand the mapping potential by allowing new image registration tools, other ontologies, and other rodent strains and species into the framework. There is also a strong opportunity for innovation in the development of primate brain coordinate systems, including marmoset, rhesus macaque and human. While fully resolving the problem of standardization in data mapping in these species is beyond our scope, we can offer innovative approaches to ontologically identifying cell location in the human and providing new tools for the mapping workflow, allowing these data to be searchable and spatially localized. As new standards become more accepted they will be integrated with the BCDC.